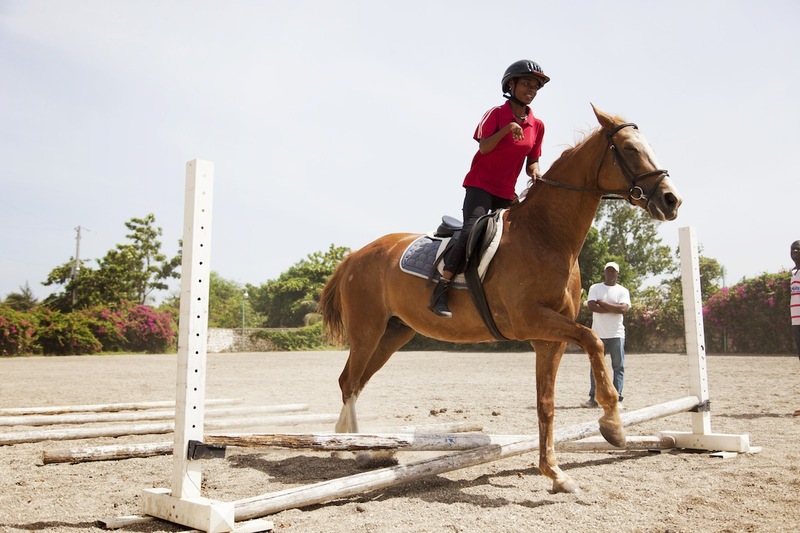 For the kids at Kay Christine, Wednesday means horse riding. The journey down the mountain to “monte cheval” begins early in the morning right outside their home in Kenscoff. A truck arrives out front and everyone loads up in the back in a state of excitement. Staff and kids help boost each other up and get situated along the benches. Each child wears a red polo, horse riding pants and boots. The ride down consists of singing and laughing and the few in-between silences. The change in temperature is noticeable as we go through Petionville and get closer to the outskirts of Tabarre. The heat is shocking compared to the cool and crisp Kenscoff. After traveling on many bumpy roads, we arrive to a gate that reveals a vastly different view. The space is open and a large stable sits towards the right. We pile out of the truck and head for the shaded area by the arena. The first group takes their turn and mounts the horses. With helmets on, they are led around the field by the staff. Beautiful pink flowers line the walls of the arena and the mountains make a perfect backdrop. Each person gets to gallop around and most do so without any assistance. While waiting, we play card games and tic-tac-toe. This time, I ask some of the kids to teach me the horse riding vocabulary in Creole and French. After a quick sketch, they label things like the “selle” (saddle) and “etriye” (stirrup) as well as the “kas” (helmet) that the rider should wear. Sitting on the sidelines, I get to see an amazing confidence arise from the kids as they ride around. Each child has a unique challenge-some physical and some mental- but when they sit on that saddle, they are free to ride. It is clear that their disabilities do not define them. I’m instantly grateful that the kids have this opportunity especially since I get to see the joy on their faces. Before we hit the road again, everyone eats a snack and rehydrates after being in the hot sun. The ride up seems to go by quickly especially since there is not as much traffic during the summer. Once we arrive and unload, the horse riding arena seems to be in a different world. We all return to our routines for the day and the horse riding pants are put away until the next Wednesday. The day for riding horses.